LEXINGTON, Ky. (Sept. 20, 2010) − Scientists at the University of Kentucky have gained new insights into the structure of an enzyme responsible for the devastating neurological syndrome Lafora disease. Findings of the research, led by Matthew Gentry and Craig Vander Kooi, both assistant professors of molecular and cellular biochemistry at UK, were reported Aug. 31 in Proceedings of the National Academy of Sciences. As with genetic diseases such as Huntington’s disease, patients with Lafora disease are symptom free for a number of years in early life. The disease begins to manifest with epileptic episodes, usually starting around age 15. Eventually, individuals with the disease die in their mid-30s from extensive neurodegeneration. Cracking the molecular mechanisms behind the disease is a first step in developing potential treatment options, Gentry says. But for Lafora disease this has taken a long time, as the exact function of the mutated human laforin protein responsible for the disease proved difficult to pin down. “When I started working on this protein eight years ago, we knew that when it is inactivated people get this terrible disease, but we didn’t know the biological function of the protein,” Gentry said. Then, four years ago, Gentry (at the time a postdoctoral fellow at the University of California, San Diego), along with colleagues from UCSD, discovered a plant protein that was similar to the human laforin, giving Gentry a model system with which to finally test laforin mutants. an enzyme that removes phosphates from carbohydrates, and that mutations in the plant version of the enzyme lead to the buildup of insoluble carbohydrates in cells and subsequent cell death, outcomes similar to what has been seen in the cells of Lafora disease patients. Now Gentry and his team at the University of Kentucky have moved a step further in their ability understanding the structural dynamics and molecular mechanisms of the laforin enzyme. Their recently published article describes the first three-dimensional structure of a member of the newly defined family of carbohydrate phosphatases to which laforin belongs. 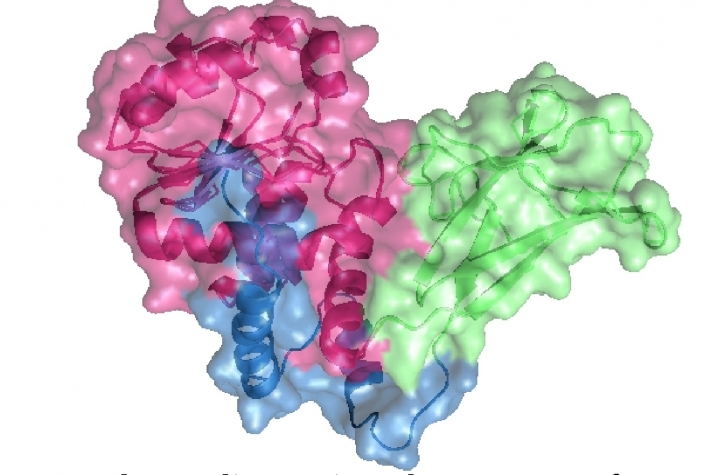 The new structure opens doors to deciphering how carbohydrate phosphatases like laforin function, allowing researchers to make educated predictions when it comes to testing enzyme efficiencies. And for Dr. Gentry, this raises the possibility of finding ways to increase the phosphatase efficiency of human laforin, thereby potentially providing a new direction to design treatments for patients suffering from this devastating disease. “The collaboration with Craig (Vander Kooi) has been really fun and rewarding," Gentry said. "Other groups and ourselves have worked on the data for this structure for more than four years, and it was beautiful to finally see what the protein looks like. It really opens up a lot of new doors for us and ideas to test."